Gerold Bepler, M.D., was named the new president and CEO of the Barbara Ann Karmanos Cancer Institute in Detroit. He took over Feb. 1. Bepler, 53, replaces John Ruckdeschel, M.D., who left last spring to become CEO and director of the Nevada Cancer Institute in Las Vegas. 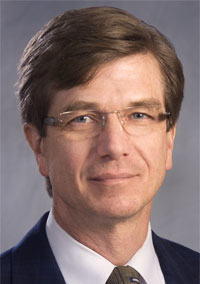 A thoracic oncologist, Bepler's additional duties will include being the principal investigator of the Karmanos National Cancer Institute's Comprehensive Cancer Center support grant; the associate dean of cancer programs at the Wayne State University School of Medicine; the director of the school's cancer institute; and the chairman of the school's soon-to-be-created department of oncology, a news release said. Most recently, Bepler worked at the Moffitt Cancer Center in Tampa, Fla., as the director of its Comprehensive Lung Cancer Research Center and as its thoracic oncology department chairman. He was also a professor of medicine and oncology at the University of South Florida. Before he took over at Karmanos, Ruckdeschel worked at Moffitt as the president and CEO. Ann Schwartz has served as interim CEO at Karmanos and will serve as interim executive vice president while helping Bepler manage administrative matters during the leadership transition.